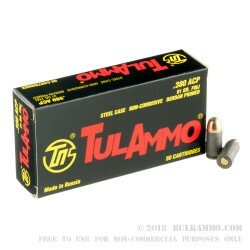 Tula's 380 auto ammo is a built with the goal of providing a low cost option to 380 shooters. Rather than brass-cases, steel is used in its place to help drive the cost down and rather than standard copper/zinc jackets used in most ammo a bi-metal jacket (standard in most Russian ammo) containing steel with a copper wash is used. These efforts go a long ways in cutting the cost of materials down for those who don't care to reload and are just looking for some cheap full metal jacket practice ammo. These berdan primed steel cases are non-corrosive and non-reloadable and feature a polymer coating to aid feeding and extraction. 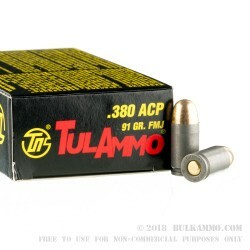 This ammo is not as versatile across all firearms compared to brass cased ammo so it's usually a good idea to buy a 50 round box to see how it functions in your firearm prior to buying a case. Fired a few hundred flawless rounds. My Ruger LCP eats it like candy.